India is one of the oldest civilizations in the world. And one of the most important factors why we have been able to sustain our identity for such a long time is that life in India has been based on some very basic and strict rules. These rules, just like the very early days of the civilization, govern every aspect of individual and social life. From education to how to live after marriage, we have some rules or the other. Marriage, for obvious reasons, is one of the biggest issues in our culture. In Punjab and Haryana, procedure of Love Marriage often ends in the funeral of the couple. However sad and violent this may be, the cause is to be traced in our history. In the revered Geeta, it is being said, that maintaining the sanctity of one’s sect and religion is of utmost importance. When taking over other countries, women and cattle by force was the very way of survival, these words were powerful messages in the road to triumph. Fortunately, we have come a long way down that time and we need to negotiate logically about forming new, more relevant rules. 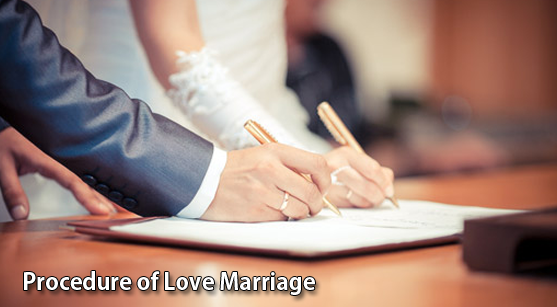 Any marriage, especially Love marriage in Chandigarh, is a matter of fortifying the identity of the families. Parents, social guardians and local community members believe that by selecting families within the sect(religion) will help us maintain the identity of the sect, therefore strengthen the social fibre. Therefore, any love marriage that involves an individual and family from outside the sect is a potential threat to the sect. Any negotiation with your parents should focus on this very fact that your spouse, being from another sect, will never disrespect or harm your belief system, neither will there be any attempt to forcefully ‘converting’ your lifestyle. a) It is the choice of the owner whoever shall the property go to. If your decision to get married to an individual without the approval of your parents leads them to ‘disown’ you, there is hardly anything you can do to mend the situation, at least legally. You should be well prepared to face the financial consequences yourself. b) However, if you and/or your partner receive any death threat, the law is more than powerful to help you out. Honour killing, however appropriated in the society, is a punishable crime and taking proper legal help will help you avoid untoward incidents. Please ask your lawyer in detail about the steps you can take and the ways of combating social evils. The relationship you share with your parents is a unique one. The relationship with your life partner, however, is an equally significant aspect. And if you feel the need, any experienced lawyer will help you balance the two with success.